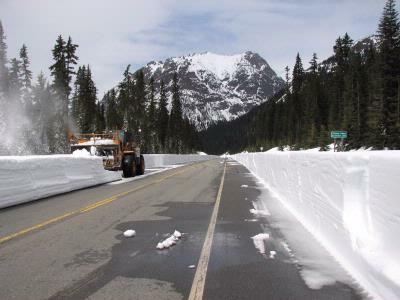 It seemed like the winter weather might never end after record rain and snow pounded the state and delayed the reopening of State Route 20/North Cascades Highway. Finally, warmer temperatures, warm rain and sun arrived and should allow crews to reopen the road well ahead of the Memorial Day weekend. With a lot of long days, and help from the weather, Washington State Department of Transportation crews turned eight weeks of work into less than six. Crews are finishing final repairs and are planning to open the highway for the summer at 11 a.m., Tuesday, May 16. The warm weather helped melt some of the snow, but those conditions also increased the avalanche risk. Safety is WSDOT’s top priority and crews used spotters and safety ditches in the snow to keep themselves protected during clearing. Some chutes still have snow, but rain over the next few days is expected to cause them to slide and get cleaned up before the highway opens. WSDOT crews started clearing back on Monday, April 10. Working from both sides, crews not only clear snow, they also repair pavement, signs and guardrails plus clear culverts and ditches of debris to ensure the highway is safe before it reopens. This year’s reopening is the third latest. You have to go back to June 14, 1974 to find the only time crews weren’t able to get this stretch open before the end of May. Once the SR 20/North Cascade Highway gates open at milepost 134 and 171, the highway will remain open through the summer and into fall. Crews will close it when conditions in avalanche chutes become unsafe, usually a week or so before or after Thanksgiving. When the highway is closed; skiers, backpackers, snowmobilers and other adventurers are welcome to use the closed stretch at their own risk. When crews are working on clearing, the area is closed Monday through Thursday.